Which end is up? The horned end? The other end looks like it has teeth. The 'teeth,' Bob informs me are really the true legs which will turn into legs when the caterpillar becomes a butterfly. The horned ind is just for show. Well, was. This caterpillar will never become a butterfly because Bob fed it to a grackle. Cause that's the way he rolls. WOW! If you're going to be nefarious, at least you should look as cool as this guy. And of course, Bob rocks. Because now you, the tomato plants, AND the grackle are happy. It's just a grackle eat caterpillar world. In case you haven't used Bacillus thuringiensis before... the stuff smells TERRIBLE. We had a bad web worm infestation back in Chicago. In the middle of summer the trees resembled nakie 'winter' trees. Hope you don't have to use it. I was midway between being horrified when I saw my first one of those... but also curiously proud, because DAMN, my backyard actually GREW something that BIG? Also hummingbird moths are damn cool. Just a comment to say that I love the pic you choose to illustrate your article! Thanks for your posts! Would you like to trade? 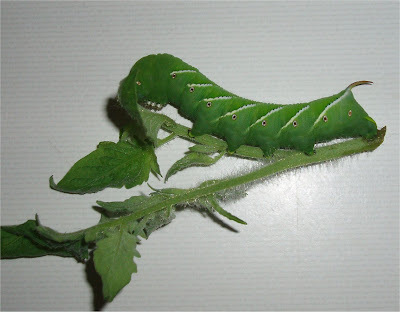 I have tomato hornworms on my tobacco plants. My chickens would've adored the caterpillar, too. I feed them large cockroaches and it's like a football game cause they can't swallow them whole and when the drop them to peck them apart, the other chickens gram them and run. Or they steel them right out of each others mouth. It really needs commentary by one of those Spanish speaking Soccer play-by-play guys. wow... it looks like that leaf..
Last week I was taking a walk in Yellowstone National Park, and a young guy offered me Tomacco...the guy told me was a combination among tomatoe and tobacco. I was shocked, but I bought a bag, and trust me, it's exquisite.